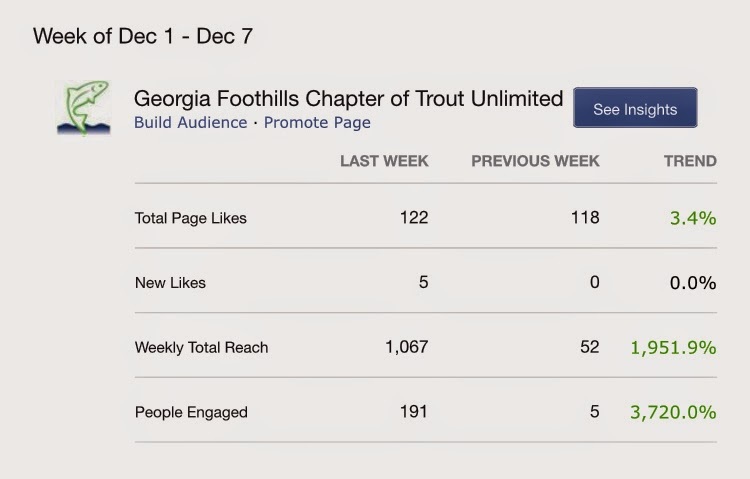 DH How-to for New Anglers – Great resources exist for new anglers learning Georgia’s Delayed Harvest trout waters. Do a little reading and then call or email an experienced friend to receive an onstream lesson. Your catch rate will skyrocket! Just like old times, Robert holding one of my fish! Caught at Cherokee yesterday. Measured about 23-24 inches. Robert said it weighed 6-7 pounds. Not a lot of fish but some nice ones. Hope you can go soon. Meeting called to order at 6:30 pm at united bank in Clarksville. Julie and Robert shared info from Georgia Council meeting. Mack Martin presented two options on global climate. TU’s position is that of global cooling. Went over 2015 events calendar and projects we are confirmed to participate in. Martins branch on July 25 9am to noon. Boggs creek August 23 9am to 1pm. Need volunteers for these projects, but may volunteer for any project on the schedule. The help is always welcome. One project that needs extra help is the Panther creek cleanup on Feb. 21 at 9am at the Yonah dam. The project is led by the Savannah River Chapter. The Dream trip ticket stubs and monies need to be turned in at the March meeting. Will be presented to the GA council at the next council meeting on March 14. Presentation by Leon Bretherton of the DNR on how projects and structures are chosen for placement in GA streams. Since 1970 the DNR, forest service, And TU have placed over 1200 structures in GA rivers, streams, and creeks. In 2oo5 the brook trout initiative began and since then over 400 stuctures have been placed to improve brook trout habitat and soil erosion. When hemlock trees are used and at least half submerged in water the structure will last approximately 30 yrs. The projects will continue to be done to improve brook trout habitat. We discussed the purchase of vises, tools and materials for our projects at North Habersham Middle school, Outdoor Adventure Day and other activities where the members do fly tying. We voted to approve the purchases and set a dollar limit. Darryl and Robert will search for the best products and present the material at the January meeting for the chapter to vote for their recommendations. Raffle of fly box and flies was won by Jimmie Harris. As good Trout Unlimited volunteers, many of us have experienced assisting Forest Service and GA DNR biologists with installing trout stream structures. But have you ever thought about what goes into making the decision which streams are best suited for a structure and what kind of results they can show for the effort put into them? Our guest speaker for the December 11th meeting, Leon Brotherton, has put together a great program about this very topic. Leon is a Habersham County native and works under Senior Fisheries Biologist Anthony Rabern at Burton Hatchery. Prior to taking the position at Burton, he was a Wildlife Resources Division Reasearch Technician out of the Summerville Hatchery. We hope you'll join us at United Community Bank in Clarkesville.